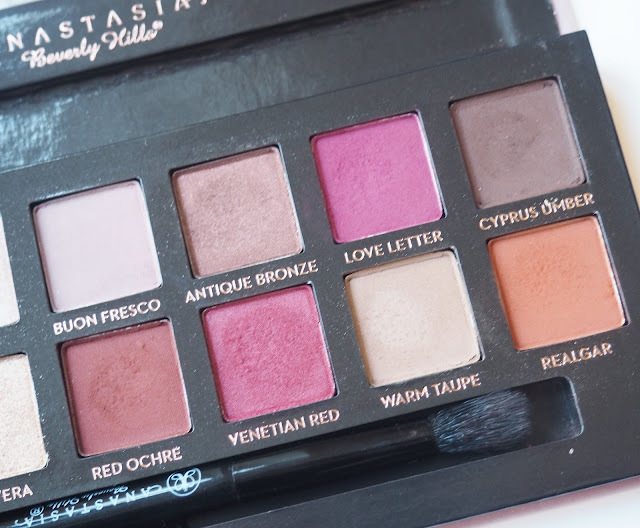 Jasmine Marie Beauty: Anastasia Beverly Hills Modern Renaissance palette- a thing of beauty! 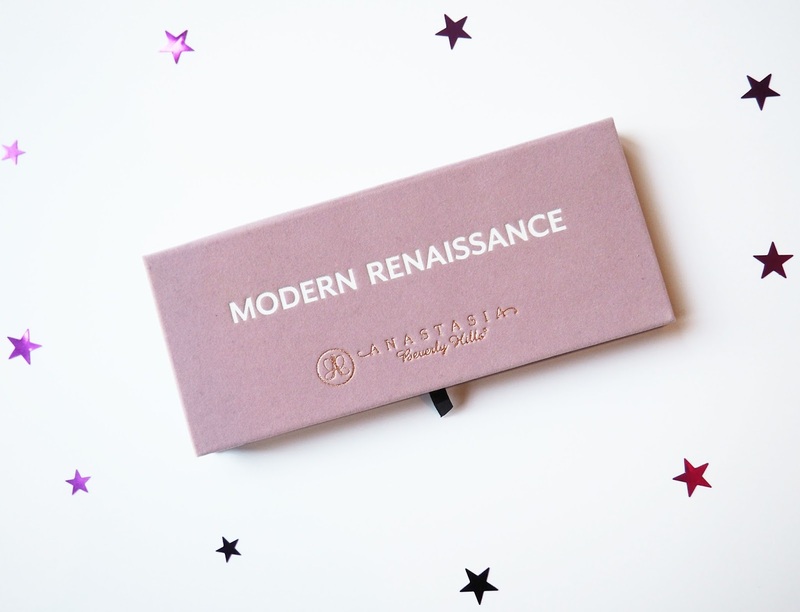 Anastasia Beverly Hills Modern Renaissance palette- a thing of beauty! I know its been review central around here later but what can I say? I've been testing out a lot of new bits and pieces so of course I have to share them with you all. 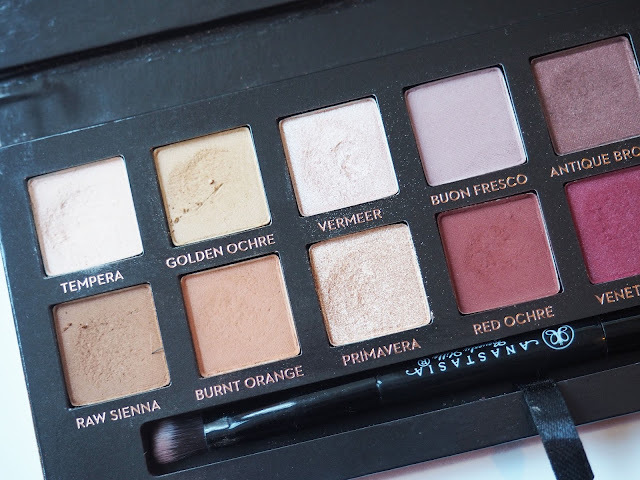 And this next one I am so excited about, its the Anastasia Beverly Hills Modern Renaissance Palette. I got this for Christmas after seeing it all over the place and was a bit giddy by the time it was delivered, just look how pretty! Let's start off with the packaging, its a gorgeous light pinky/ purple velvet. Yes this is a magnet for dirt and probably won't stay looking so nice that long but I'm gonna damn try to keep it in pristine condition. I've even been keeping it in the box in a bid to protect it! This baby costs £41 which I know is a little steep but in all honesty I think this is worth the price tag. You get 14 absolutely beautiful shades, ranging from neutrals to more vibrant pink shades in shimmers and mattes. These are the first ABH shadows I have tried and yes I was expecting them to be good, but this good? Not a chance. They are the softest, smoothest, most pigmented shadows I have ever used. Ever. I just can't even put in to words properly how amazing these are. I took this palette to my friends house recently and even she seemed a little stunned! You get a double ended brush, one end is fluffy for blending and the other end is more for adding definition and packing on the colour. Usually I don't even bother testing out brushes that come in palettes as they are notoriously crap and I have my own favourites. Something about this one though looked half way decent so I have used it a few times, its still not my favourite but it gets the job done and if you're wanting to travel without taking loads of brushes then this is ideal. When you dip your brush in these there is always a little cloud of powder that kicks off these but don't let that put you off. They apply like a dream, minimal fall out, smooth, easy to blend, perfect colour pay off. I can't fault these, normally there is at least one shade thats a bit naff but honestly the formula of each and every single one of these is dreamy. My favourite colours are Buon Fresco- a lilac/ grey colour, Red Ochre- a matte, rusty red shade, Venetian Red- a shimmery red and Love Letter- a vibrant magenta pink. The colours are so well put together that you have shades for so many looks and uses- all over the lid, crease, outer v, inner corner, its all covered in here. I have been having the most fun testing this out lately and have fallen so in love. Being such a popular product at the moment you may have a couple of problems actually trying to find this in stock anywhere. Beauty Bay and Cult Beauty both stock this palette and you can sign up for the waitlist which means they will email you as soon as its available again. I was lucky enough to get mine on the newly launched Anastasia Beverly Hills UK website so its definitely worth trying your luck on there too! Get this on your payday treat list as I promise you you'll be wondering where this has been all your life!